I built a mechanical Hellschreiber (receive/print only) in 1983. 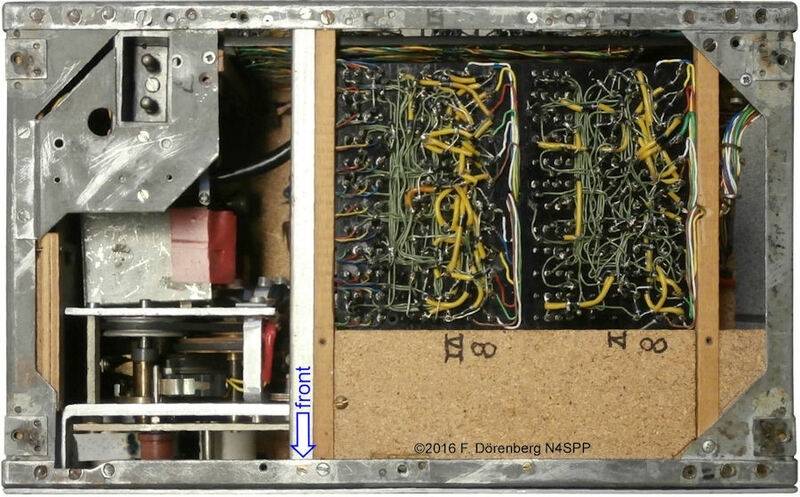 Most of the structure was made of double-sided printed-circuit board, precision-cut with a CNC machine during a summer job at the Dutch public telephone company (PTT) in 1982. It measures 15x8x12 cm (WxHxD, ≈6x3x5 inch). The printer spindle and the paper transport rolls were machined while I had a student job at Philips Research Labs in Eindhoven in 1983. I used a small motor with integrated down-gearing paper transport, and a servo motor for the printer spindle. The circuitry that I used for the tone detector, solenoid driver, and motor speed control (paper transport and spindle) is rather simple. See the schematics below. The transistor types really date the design! A solid-state implementation of the driver circuit typically needs a diode (installed with reversed polarity) across the magnet solenoid, to avoid damage to the transistor due to the inductive voltage spike upon de-energizing the solenoid. Alternate detector designs are described in ref. 2A and 2B. If the relay is a bit slow to respond when energized, you may try to speed it up with one of the simple circuits described in ref. 2D, 2E. They basically briefly apply almost twice the supply voltage to the relay coil when energizing. 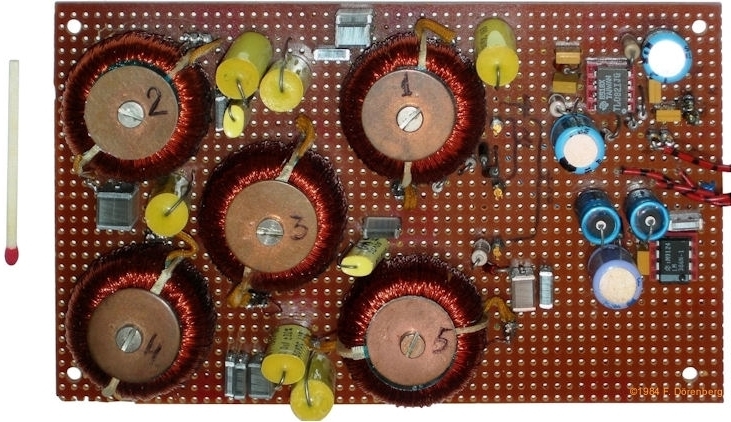 The capacitor in the circuit will have to be adapted to the desired speed and relay (decay time). My ink-roller is made of several round felt pads that I stacked and glued together, and drilled a hole through the center. The pads are simply felt bumper-feet for furniture (the ones with adhesive backing are the easiest), available in several forms and sizes at your local Do It Yourself store. An other option is a felt polishing wheel (or tip) from a Dremel® type rotary tool. I used Pelikan-brand endorsing ink. It is thick and comes in a tube. The label says that it is intended for felt pads. Just what I need. You just may want to use gloves when handling this type of ink! And don't use water-based ink; not only will it cause the spindle to rust, the capillary properties of the paper will cause the ink to be dispersed and make the print fuzzy. Paper transport speed calibration is easy: all you need is a stopwatch and a ruler or tape measure. Simply adjust the motor rpm to obtain about 47 cm per minute. Unlike the spindle in a Feld-Hell machine, my spindle is a single-thread (1-start) worm. It needs to turn at 7 columns per character x 2½ characters per sec x 60 sec/min = 1050 rpm. The Feld-Hell machine has a double-thread (2-start) spindle: it has two intertwined windings. Note that the number of threads is not related to the number of turns of each thread! Both the Feld-Hell and my homebuilt spindle have two turns. The Feld-Hell spindle only needs to turn at ½ x 1050 = 525 rpm, to get the same effect as a single-thread spindle at 1050 rpm. Adjusting the spindle speed to 1050 rpm can be done several ways: 1) first get the electro-magnet to work properly (which you have to do anyway), then feed the printer with "known-good" Hell-audio and adjust the rpm until the print becomes legible and the text lines are horizontal; or 2) use a tachometer. I used method nr. 2 by building a very simple optical sensor (4 cheap components), attaching a strobe disk to the spindle shaft with a dab of glue, and measuring the sensor output signal with an oscilloscope. You can make a crude strobe card with a black felt marker, but such markers are really not black at all, and the ink does not have good reflectivity. Best is to print one on regular paper with a laser printer. Here is a file with strobe disks that have 1, 2, and 4 black segments and ≈5 cm (2") diameter. The sensor simply consists of an infrared LED and a phototransistor. No specific types (you can also use an IR diode + transistor in a single package, e.g., an SY-CR102). I shielded them with shrink tube (black on the 5 mm LED, blue on the 3 mm phototransistor in the photo below). As you can see in the photo, I bent the leads such that the diode and transistor are not parallel, but are trained at a point just in front of them (about 2-3 cm, 1"). The largest swing in the sensor output signal (5 Vpp) was observed at a distance of 0.8-1 cm (≈3/8") from the strobe disk. The scope image below indicates that the spindle is turning at 1500 rpm, and needs adjustment. A strobe period of 10 msec (100 Hz) = 100 cycles per second, and 4 black segments on the strobe card means 100/4=25 rps which is 25x60=1500 rpm. The scope is set to AC-coupling. A couple of years ago, I bought an inexpensive digital tachometer (model DT-2236A) on eBay, for maintenance of the motor-generators of my Feld-Hell machines. It can be used optically (laser + a marking or strobe disk on the rotating object), or by contact (surface speed or shaft speed, with various attachments). 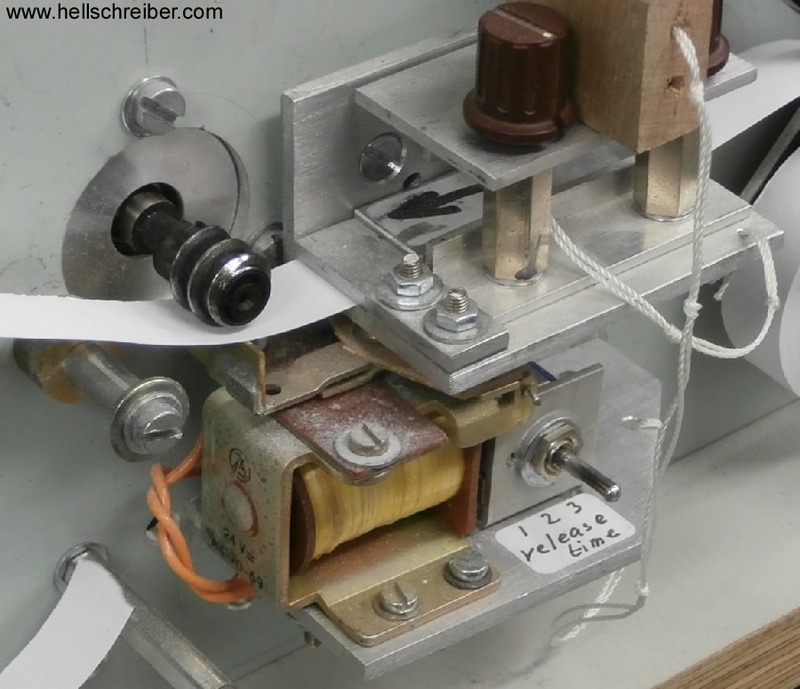 Below are photos and descriptions of Hellschreiber printers (and even electro-mechanical senders) built by other radio amateurs, with varying degrees of sophistication. See ref. 1A-1J. 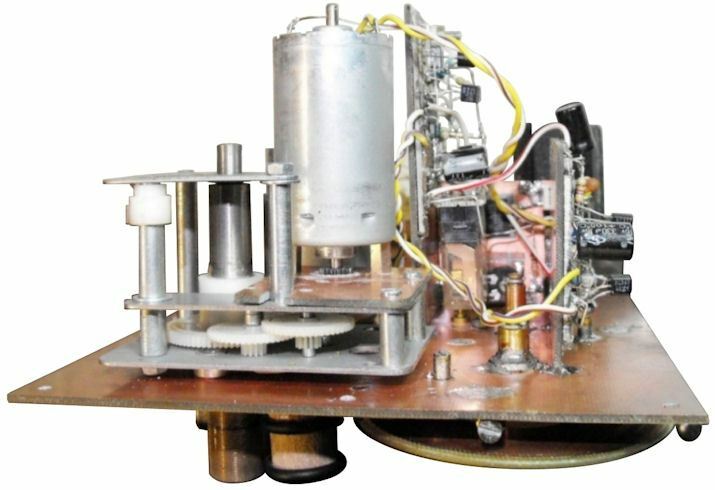 The circuitry of the spindle-motor speed regulator is interesting: it comprises a Wheatstone-bridge, in which one branch is formed by the motor winding, and another branch by a resistor with the same value as the motor's DC resistance. Mart built another one in 1980 (ref. 1A) and a third one in 1982 (ref. 1B). The last one used a bicycle dynamo for a DC-motor. 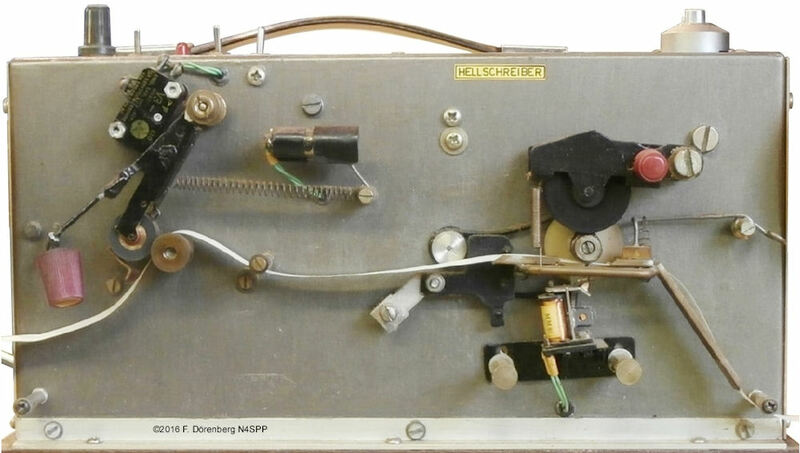 Eckhard Bremer, DG9JO/DL4EBV, was inspired to build his printer, seeing Mart, PA0MJS, and his machine at a ham fest in 1980. 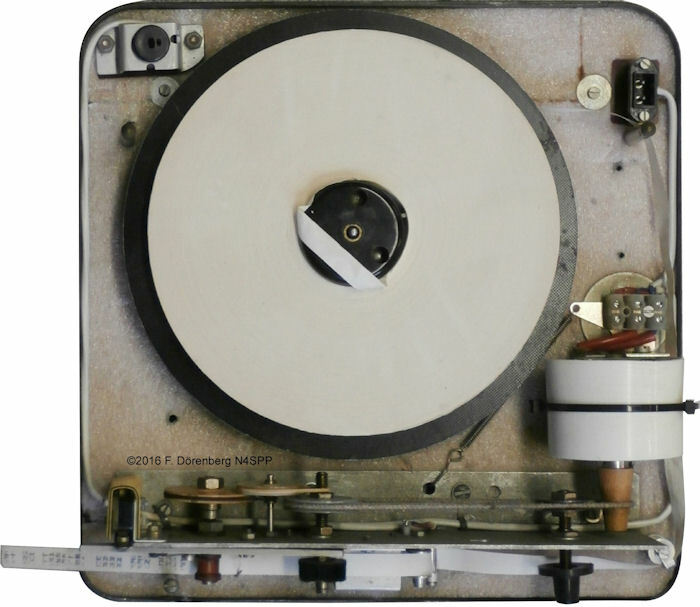 Eckhard used the motor (with a flywheel) and speed regulator from a cassette tape player. Martinus (Mart) Rooth (PA0MRB, SK), and XYL Ans (PA0ARB, SK), built a complete and modular Feld-Hell "clone". The keyboard sender is based on a modified typewriter keyboard! See ref. 1E. However, it does not have a spinning character drum with slip-contacts. Instead, there is a single, stationary character-disk. It has 7x14=98 contacts (one for each pixel of the Hell font) and a rotating arm with a two brush contacts. The conductive metal patches of the character drum are replaced by a large diode matrix (±800 diodes). For each character on the keyboard, there is one set of diodes for the associated black pixels. The printer helix is made of 2 turns of a heavy-gauge steel spring (5 mm ID), stretched to 10 mm (for 10 mm wide paper). 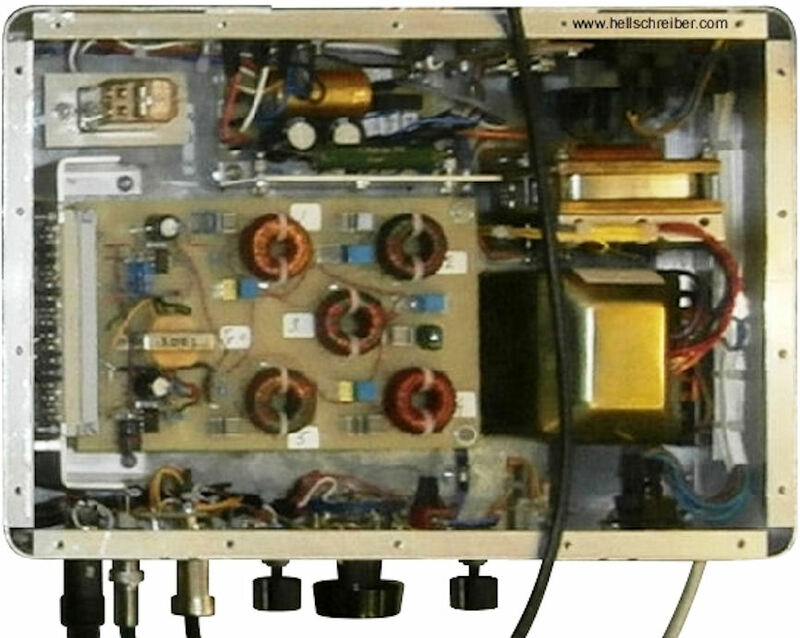 The amplifier is based on an ECF80 triode/pentode. The construction project took several years. The adjustment for the motor speed is quite interesting: it is a continuously variable transmission (CVT). The motor drives the spindle via a string. The motor shaft is conical. The string passes between two washers that can be moved by turning a knob on the front panel. This moves the string on the conical shaft: the larger diameter part of the shaft results in a higher spindle speed (at constant motor speed). Likewise, if the string is moved to the smaller diameter part of the conical shaft, then the spindle speed is decreased. The motor is mounted on a spring-loaded swivel, to maintain tension on the pulley. 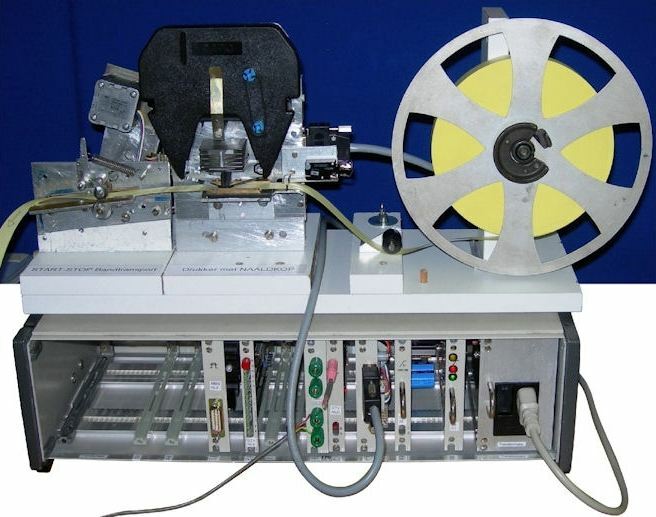 This printer uses standard 9.5 mm (3/8 inch) wide paper tape, like the start-stop Siemens-Hellschreibers. The spindle is actually a steel threaded insert, from the do-it-yourself store. It has a coarse (large-pitch) screw thread on the outside and a fine thread on the inside. It was cut to size, such that the thread makes exactly two turns. The machine built in 1982 by Louis Crijns (PE1DXH/PA3DSA) used separate motors for paper transportation and the spindle. 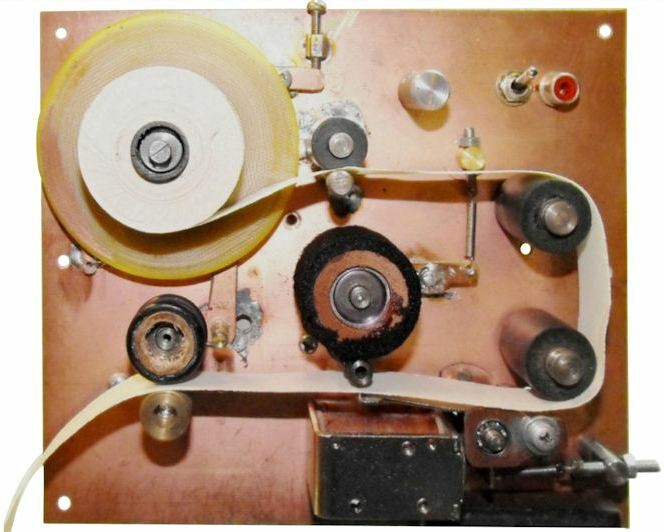 The spindle was electrically heated, and "printed" on heat-sensitive paper tape. Also ca. 1982, Germain Geerinck (ON4IB, SK), built a magnificently machined compact Feld-Hell printer. 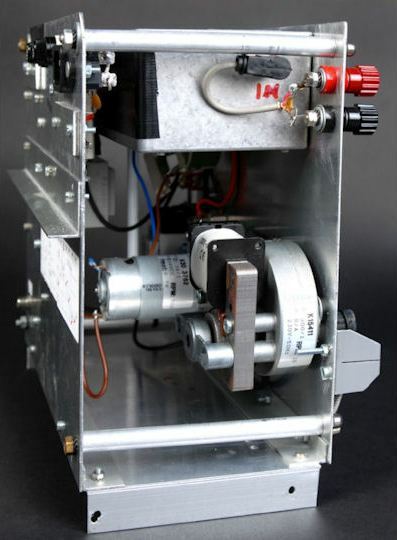 It uses a strong 1200 rpm asynchronous motor that is kept running at the required 1050 rpm with a centrifugal regulator. Ref. 1J, 1P. 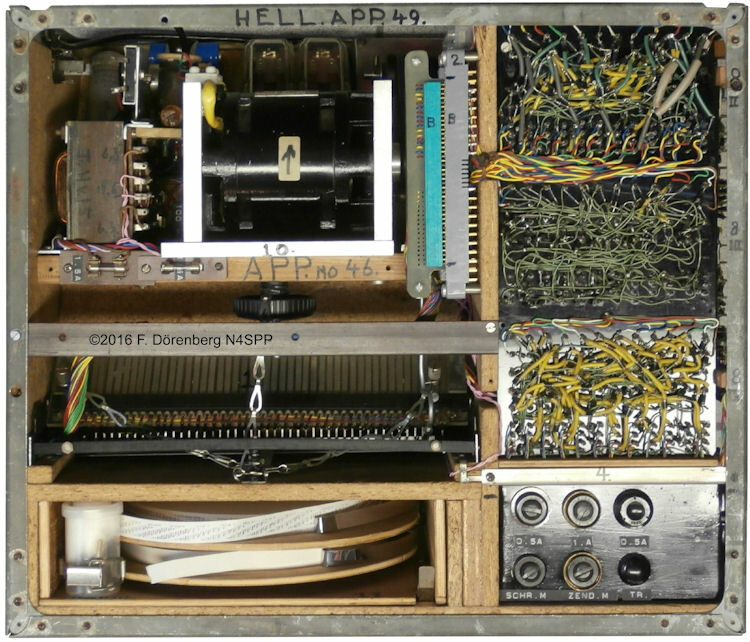 OM Anjo Eenhoorn (PAoZR, SK 2017) built several versions of his Hell-printer during the period 1982-1989. 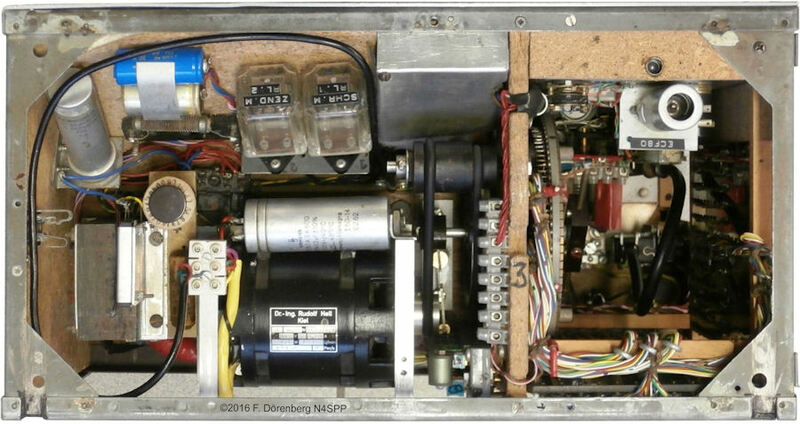 Initially, he used a small synchronous 220 volt / 50 Hz AC motor from washing machine timer. Then he used a similar motor, but with an integrated gearbox. 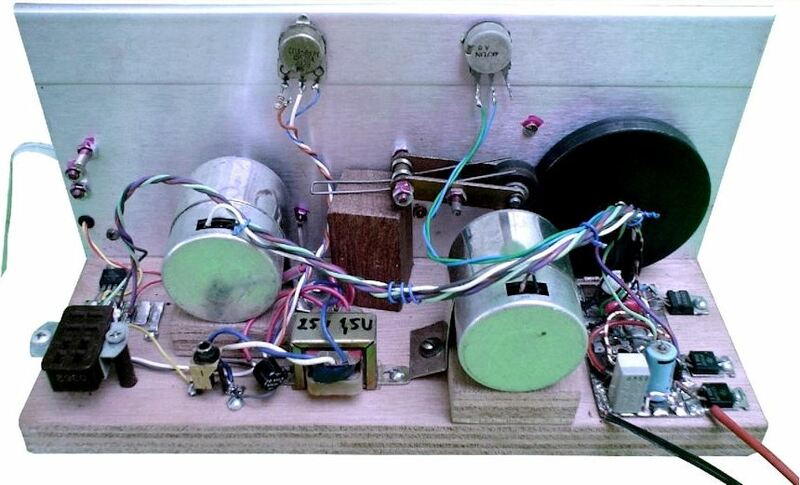 He re-wired the motor for 12 volt / 50 Hz, and powered it with a 50 Hz square wave. The motor ran at 2 rpm. The printer spindle had a brass shaft, with a two-turn thread made of 0.5 mm stainless steel wire. Like most builders, he modified a relay to make the tapper. The ink roller was made of two felt disks. 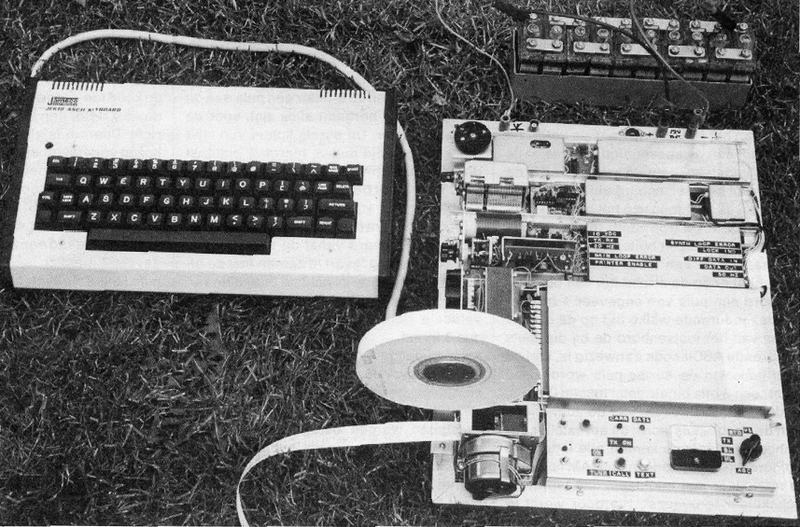 The printer used standard teleprinter paper tape. The printer is small: it is mounted on a 7x7 cm (≈2.75x2.75 inch) aluminum plate. Anjo actually built not just one printer, but two complete "printer + transceiver" stations! 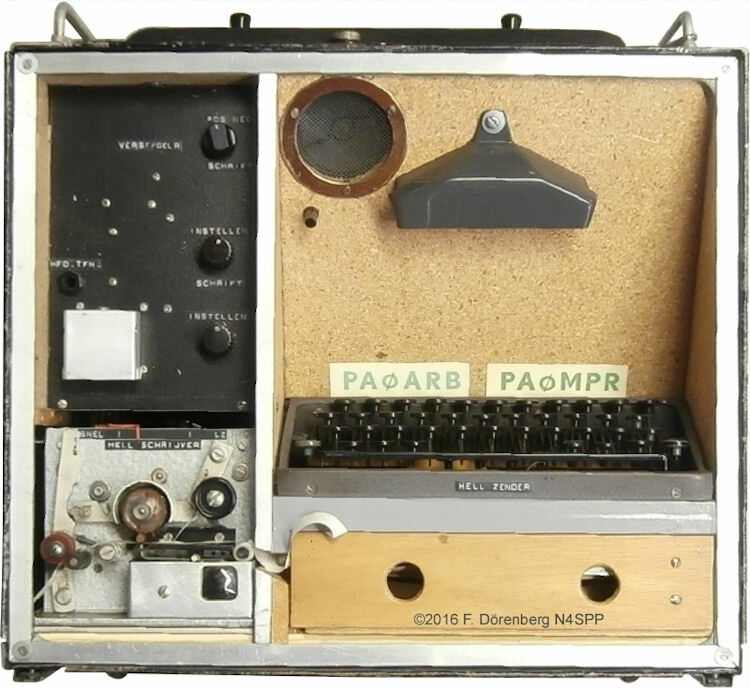 The transceiver used a synthesizer for operation in the 80 - 40 meter band, with 15625 kHz channel spacing. An antenna coupler (ATU) was included. Output power was 4 watts. The receiver used an automatic frequency search-and-lock loop, based on a "Costas"-demodulator/detector. The system actually operated at about 1/7 of the normal Feld-Hell speed: 20 baud (20 bps). RF bandwidth was very narrow: a little over 20 Hz. Anjo used BPSK phase modulation. I.e., "BPSK slow-Hell" avant la lettre. Note that the system was not compatible with standard Feld-Hell or Presse Hell. The transmitter was keyed with a keyboard-sender. The font mememory was a standard character generator: the popular 2516/CM2150.This 3072-bit CMOS ROM chip contained 64 characters with a 5x7 pixel matrix (in a 6x10 field). I.e., not a Hell font. A handful of other chips were used to generate the 50 msec pixel pulses (three binary counters, a character RAM/buffer, and an address decoder). Ca. 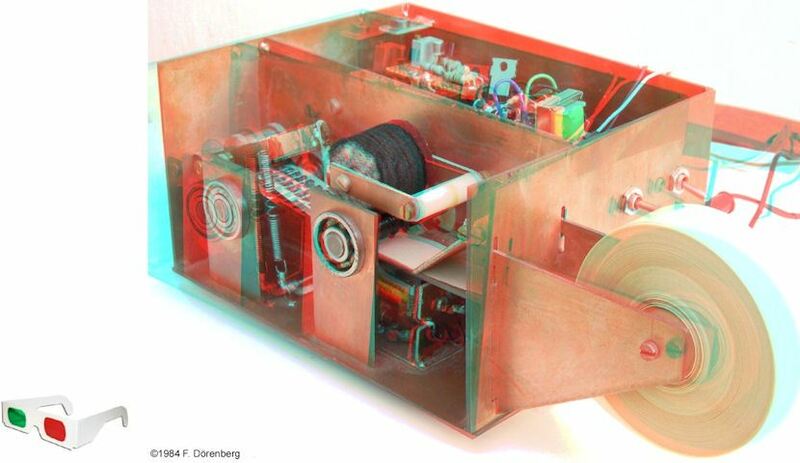 1997, Bastiaan, PA3FFZ, built the Hell-printer shown below. Ref 4. The spindle is etched from a brass rod. 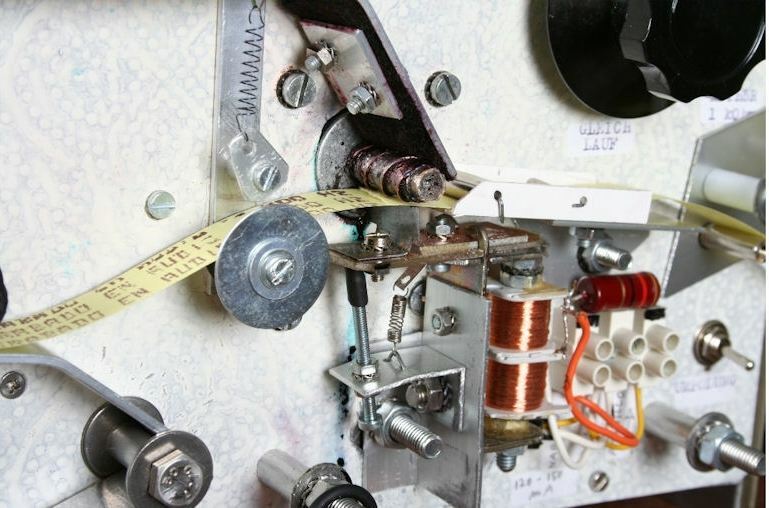 The two motors are tape transport motors from a VCR (high torque and easy to control speed, unlike VCR video-head motors). 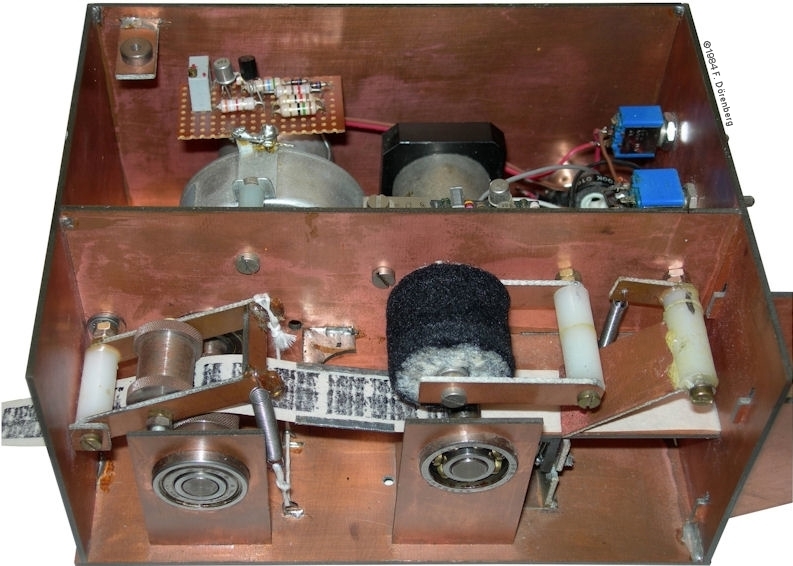 Dale, VK1DSH/VK2DSH, built his Feld-Hell printer/sender in 1999. Ref. 1F. 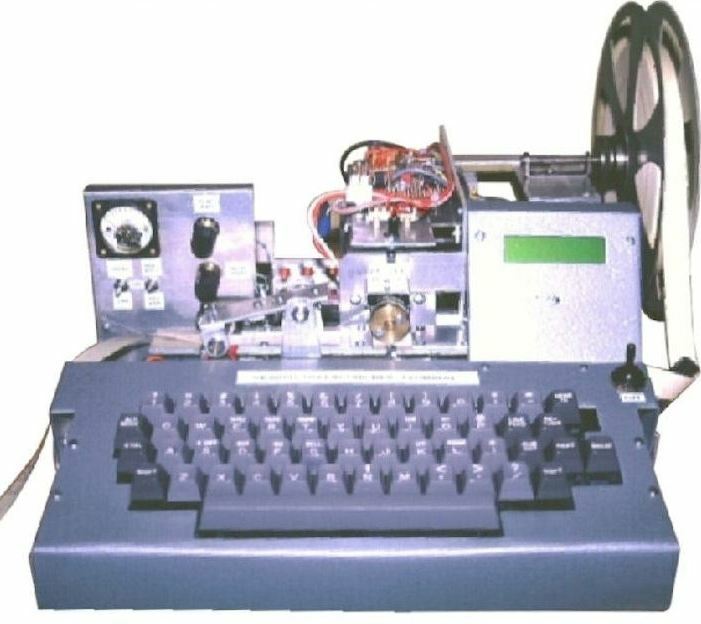 It uses an ASCII keyboard from a TTY terminal, a Single Board Computer (SBC) with a 65C02 processor, a spindle motor (with optical encoder) from a DEC line printer, paper transport stepper-motor from a 5¼" floppy disk drive, electromagnet from a telephone relay, 16-character LCD, electronics for motor speed control, tone generation, and tone detection/magnet driver. It prints onto standard 11/16" telex paper tape. Jan Smeets (ON4ASZ, ex EA3DPB) has built several Hell-printers over the years. 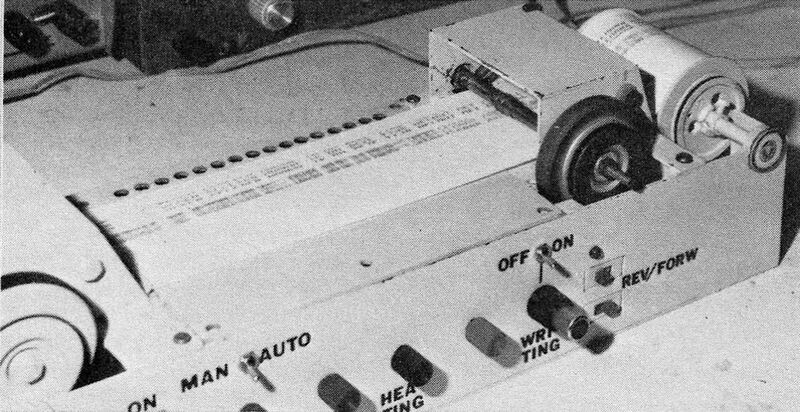 In his first machine, he used a 220 Vac squirrel-cage motor for paper tape transportation, and a 24 Vdc motor for the printer helix. Coarse speed control is done with a rheostat/potentiometer. 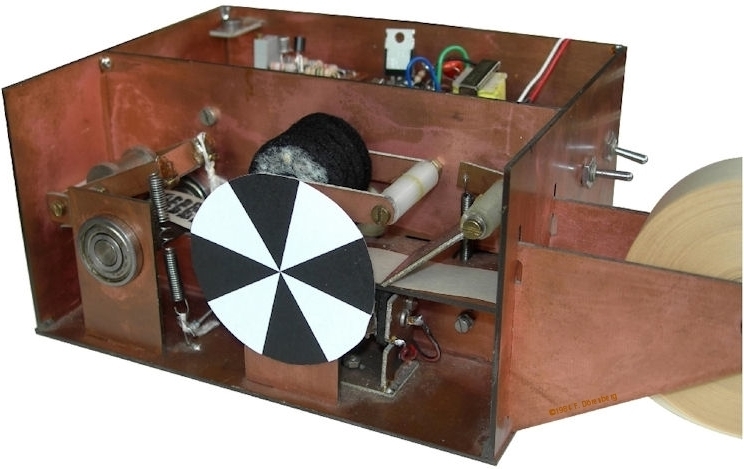 The printer's electro-magnet came from an electro-mechanical pulse counter (mfr: Hengstler). It prints on standard 11/16 inch wide Telex punch tape. Jan completed his second machine in August of 2010. 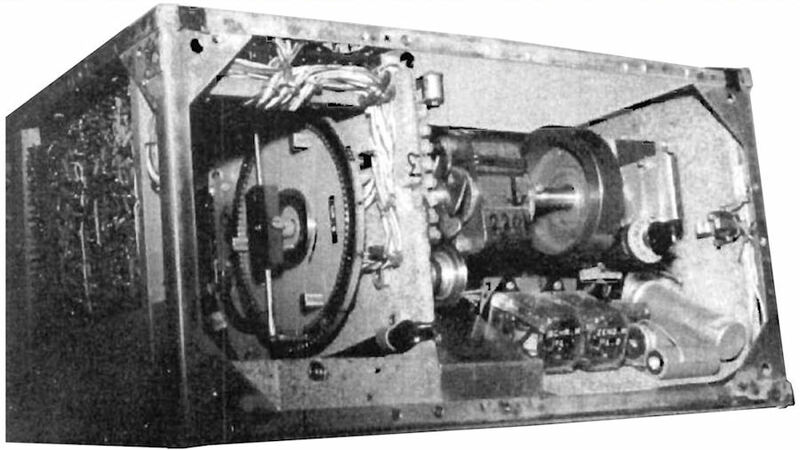 Figure 42: The inside of Jan's second machine. Jan finished construction of his third machine in February of 2012. 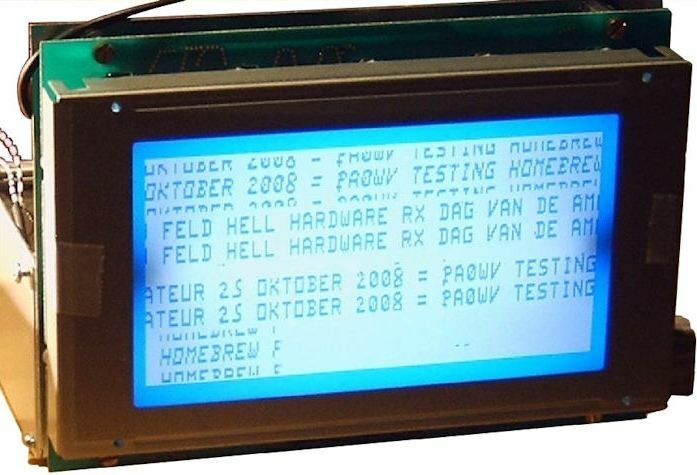 In 2008, Wim, PA0WV, made a fully electronic Feld-Hell "printer", ref. 1G. It has a 256x128 pixel graphic display LCD (an old Optrex DMF610 with a 12.7x7 cm viewing area) and an AT90S8515 processor with an 8 MHZ clock. 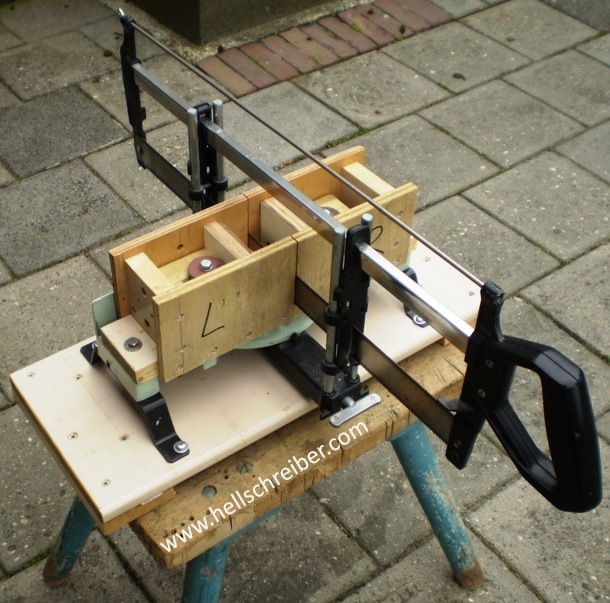 Arie van Ooijen, PE1AQB, has built has built a very nice modular Hellschreiber printer system. He demonstrated the system at the 33rd annual Hell Meeting (October 2010). It includes his latest addition: two interchangeable printer heads for the start-stop Hell-80 mode - a "world's first"! 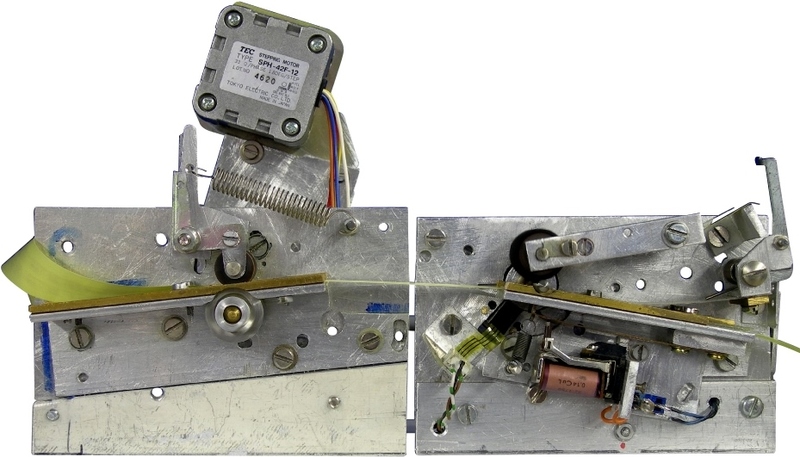 One printer head uses a continuously spinning spindle, the other uses a 7-pin needle printer-head and ribbon cassette from a PC-printer. The paper transport module uses a stepper motor. The electronics are implemented on several circuit-cards in a rack. Figure 48: The Hell-80 character set, printed by Arie's needle printer-head. Making a start-stop Hell printer (or more precisely: a printer that is compatible with the start-stop Hell-system) is tricky. The original Hell start-stop equipment (Hell-72, Hell-80) uses a continuously turning motor and a complicated clutch mechanism - not suitable for home-building! Arie has kept the continuously turning motor, but does not use a clutch. His ingenious solution detects the start position of the spinning spindle, with a pin that protrudes radially from the hub of the spindle shaft (see photo above). The pin passes through an optical detector. The detector's output signal signal is sampled, and shifted through a FIFO-register. The depth of the register is equivalent to a single column of the Hell-characters. Upon detection of the start-pulse of a character (5 pixels in the first column of the Hell-80 font; effectively at least ≈ 3 msec of the "mark" tone), the FIFO buffering is used to delay the received pixels until the pixel stream is properly aligned with the position of the spindle. See ref. 1H. The latest creation of Arie is another Hell-80 compatible start-stop printer. The paper transport motor and spindle motor with optical detector are as described above. The helix shaft, printer magnet, and chassis parts are from a salvaged Hell-72 machine. 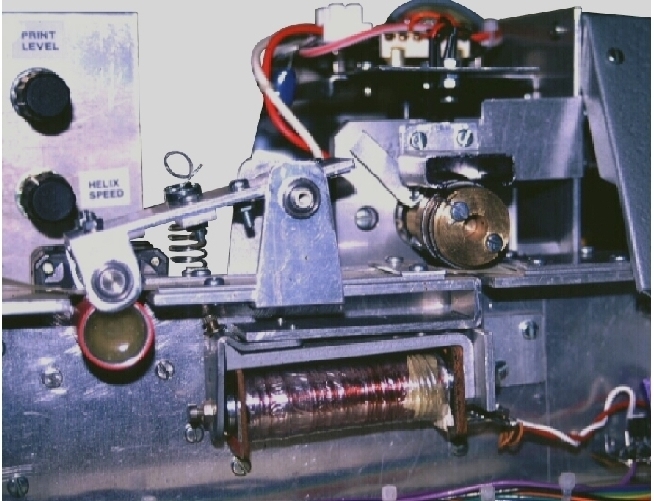 The original printer spindle was damaged; the damaged spindle thread was removed and replaced with a 2-turn steel spring (i.e., with intent to use it as a Feld-Hell printer). 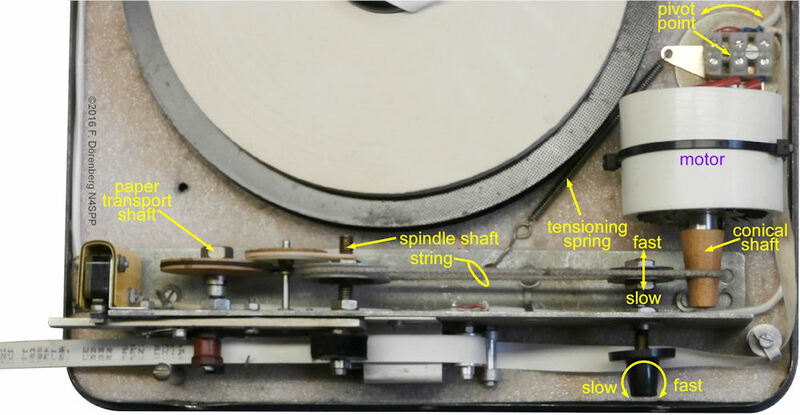 The photos below show operation with 9.5 mm wide paper tape, whereas the modified 2-turn spindle was dimensioned for 1/2 inch wide paper tape. 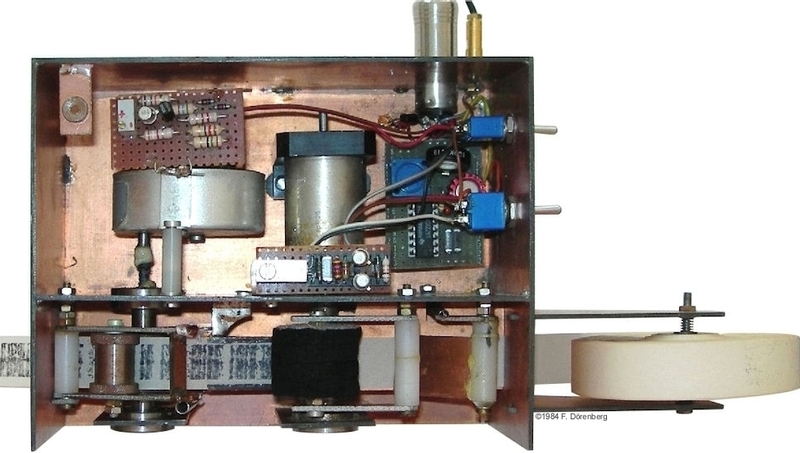 Gerhard Oberforcher, VE6AQO/DL9BBR, has been working on a beautiful compact printer. 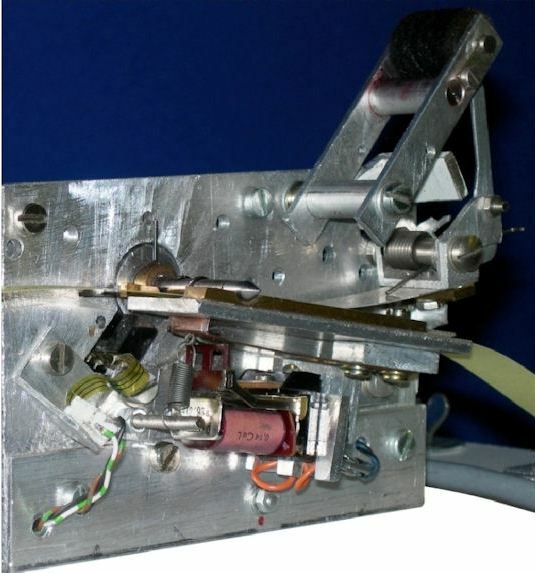 The photos below show the status of his drive-unit module in 2012. 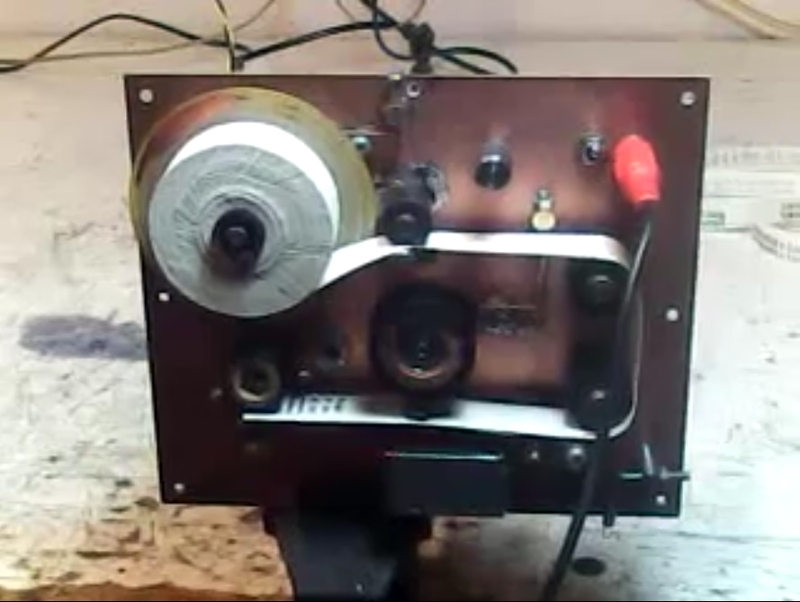 The motor is a Buehler Tacho that came out of an old Tandon Floppy Disk Drive. The associated speed controller circuitry is re-used, to maintain accurate and stable speed. 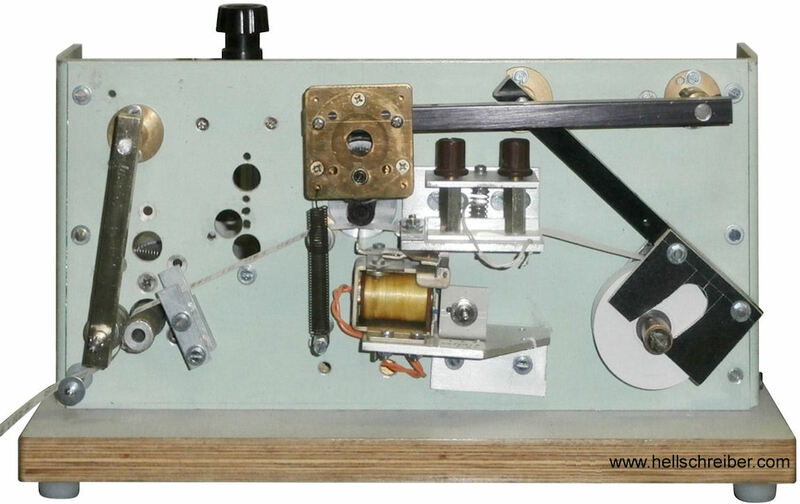 The drive-shaft for the paper tape transportation is driven by down-gearing the spindle-shaft with a 40-1 worm gear drive. The shafts are held in place accurately by slightly pre-loading the ball bearings. On the back of the spindle shaft, there is a combined flywheel and optical encoder disk sensor. The sensor has two outputs. One output provides the pixel clock for sending pixels. The other output provides an index pulse twice for each full shaft-rotation. The pixel clock has a period of nominal 8.16 msec ( = 2x standard Hell-pixel duration). The index pulse has a period of 57 msec. The slotted strobe-wheel has 14 pixel-cutouts ( = 1 pixel column) and two index-cutouts. A slightly longer opto-interrupter detects the index pulses. The index pulse is active a little before the pixel clock. This allows the interrupt handler of the PIC processor to detect the presence of the index pulse. This linkage will synchronize the sending of character pixels the same way it is done in a Feld-Hell machine with its character drum that is rotated continuously by the central motor. 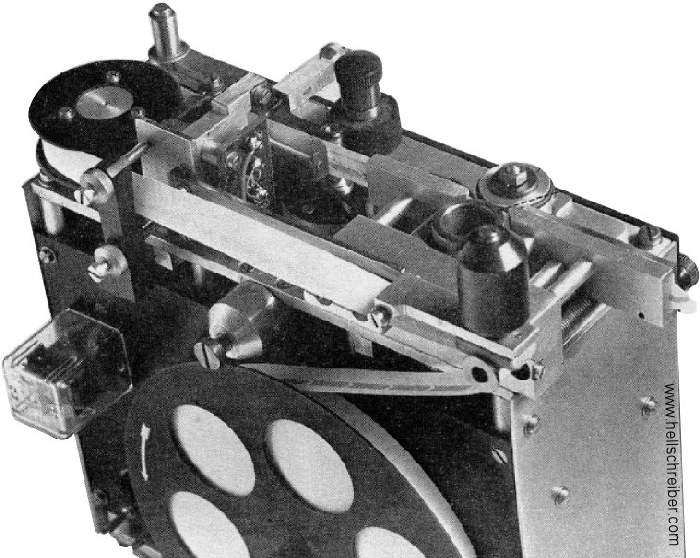 The ¼ inch tape drive-shaft is driven via a 1:1 bevel gear. 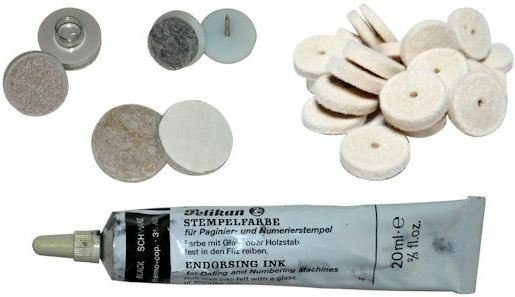 The ink felt roller is made of felt, from salvaged inkjet printers. The entire sending of characters will be done with a PIC, programmed to clock out characters pixels with the timing of the drive train. Michał uses the tone-pulse detector circuit design from Max Perner (DM2AUO). Rommert (PE1DCF) built a Feld-Hell equipment set in 2017. He demonstrated it at the 40th Annual Hellschreiber Meeting that was held in October of 2017. 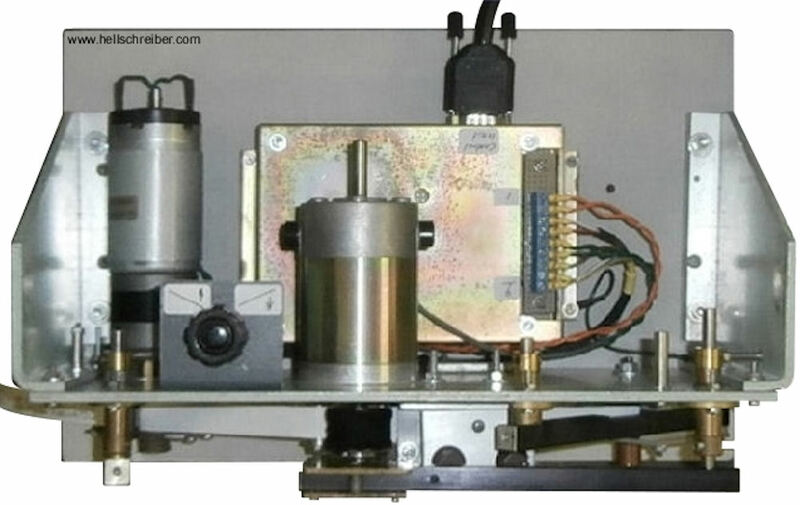 As shown in the photo above, the printer has two small motors. 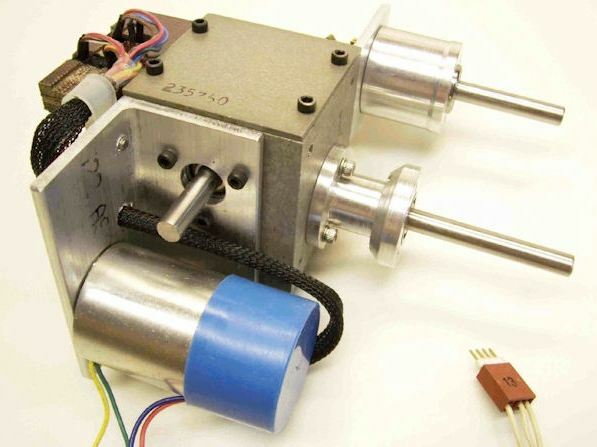 A 12 volt DC motor drives the printer spindle. The motor measures 52x80 mm (diameter & length of the housing; ≈2x3.2 inch). Supplie with 12 volt DC, it has an unloaded speed of about 1300 rpm. This is regulated down to the required 2.5 char/sec x 7 pixel colums per character x 60 sec/min = 1050 rpm. The paper transport motor is made by Stegia and has a 25:1 gear train. 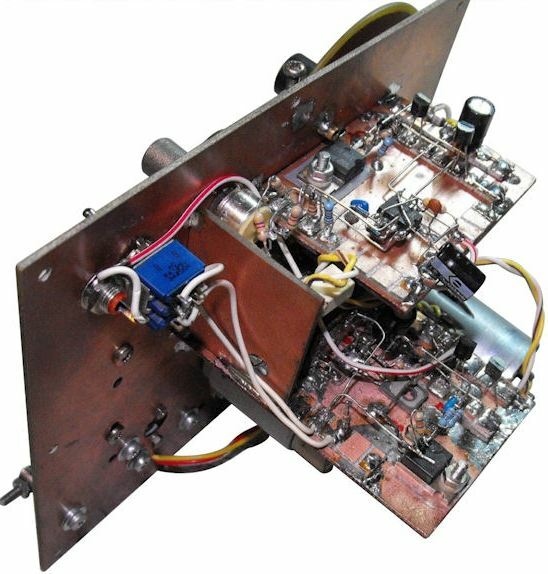 In this application, it is powered with only 1.7 volt and the output shaft has a speed of about 13 rpm. 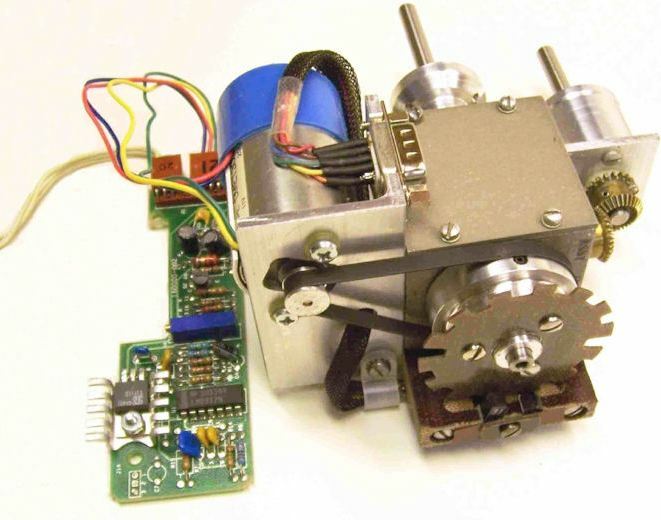 Both motors have adjustable speed control electronics that is based on ref. 2F. The pinch-roller (13 mm diameter; ≈0.5 inch) is covered with emery cloth ("sandpaper" cloth), to increase traction on the paper tape. The spindle is a steel threaded insert (a.k.a. 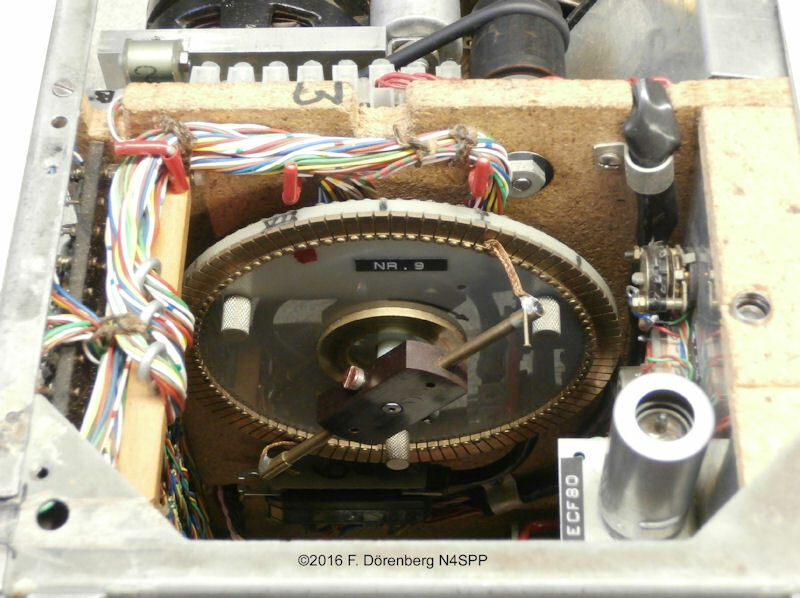 screw-in nut, insert nut) from the do-it-yourself store, just like Kees (PA3AFD, SK) used in his 1984 printer. It is pressed onto the motor shaft (after heating it up with a small blow torch). The length of the outside M6 thread has been reduced, such that it makes exactly two turns. Unlike the threads of the original Hellschreiber printer helix, the insert has a right-hand thread. 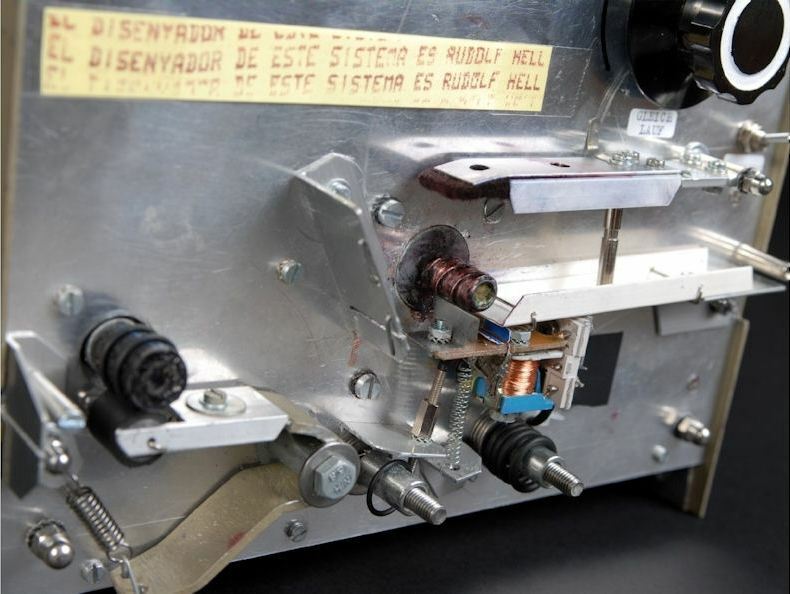 With a standard right-hand turning DC motor, the thread of the insert pushes agains the direction of the paper tape. However, the paper tape transport is strong enough that this is not a problem. 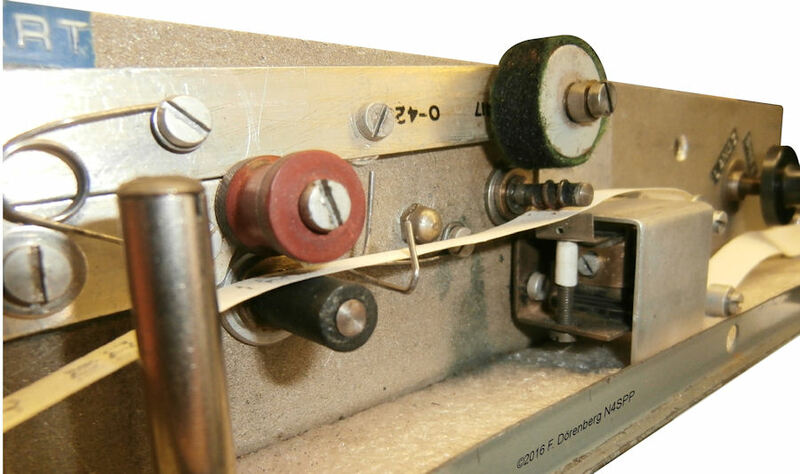 The printer magnet is a 24 volt DC model AZ7069, made by American Zettler. The relay contacts have been replaced with a small brass printer-hammer plate. Normally, a single flyback diode (a.k.a. snubber diode) is installed reversed-polarity across the realy coil. This is done to suppress the high voltage peak that is induced when the relay is de-energized. Here, not one suppressor diode, but three selectable zener diodes are placed across the relay coil. This makes the relay's drop-off speed somewhat selecteable, which may improve print quality under certain conditions. The relay coil is keyed with an adjustable 80-120 DC voltage, via a series resistance. The keyboard was taken from a Siemens T1000 telex machine. The T1000 normally has a keyboard with 59 keys. Rommert only retained the standard Feld-Hell key set and layout, expanded with the space key and the "period" key (dot, full stop). I.e., there are 42 character keys in total. This requires 6-bit character address encoding. 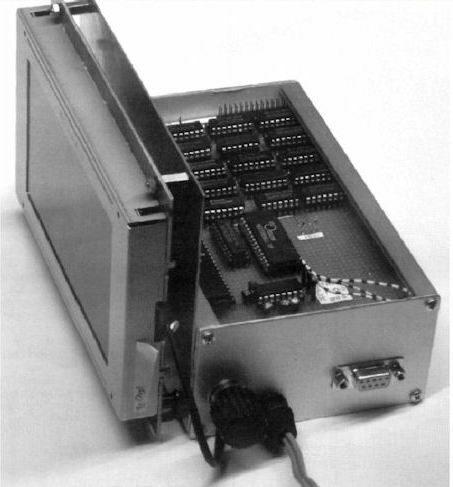 Hence, the original T1000 diode matrix was modified into a 42 x 6 bit matrix. The original Hell font has a 7x14 pixel matrix. I.e., 98 pixels in total per character. So, the actual character memory is a 42x98 bit matrix. An alternative approach (without type-ahead buffer) with a 6- or 7-bit ASCII keyboard and a character generator ROM is described in ref. 1L (1982). 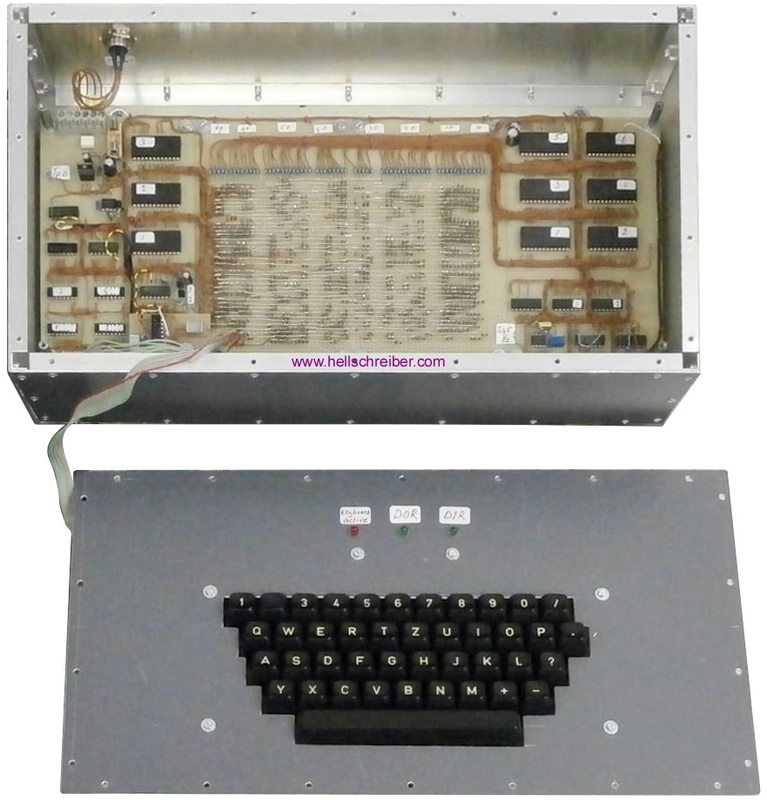 It uses a 64x6x8 ASCII ROM that was produced by Signetics in the 1970s/80s (silicon gate MOS 2516), ref. 1M. Standard Feld-Hell transmission is done at 2½ characters/sec. Hence, 2.5x98 = 245 pixel pulses / sec. This is why the clock oscillator in the diagram above runs at 245 Hz. Transceiver PPT switching is done manually with a switch on the electronics box. 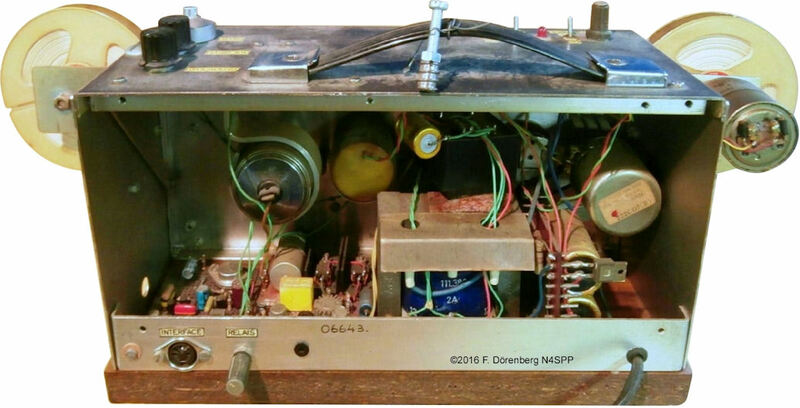 The sharp audio filter is like the one that I built myself in 1983, designed by Klaas Robers (PA0KLS). See the description below. However, Rommert moved the center frequency down from 1000 Hz in the original design, to the standard Hellschreiber tone frequency of 900 Hz. Original Hellschreibers used 15 mm wide paper tape. Rommert makes 14 mm wide rolls, by cutting 44 mm wide cash register paper rolls into three narrower rolls. This is done with a jig (see photo below) and a miter saw with a coarse-pitch blade. A fine saw blade tends to get stuck. To get clean edges, the wide roll is wrapped with painter's tape (masking tape). 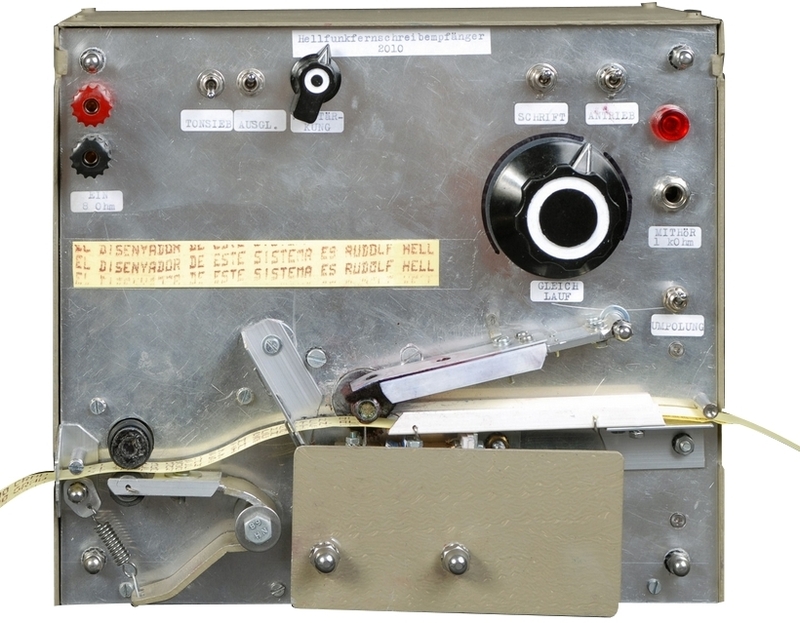 When I started getting involved with "Hell" (late 1970s), I only had an old WW2 receiver (BC348/BC224). It crystal filter was InOp (now I think that the IF frequency was probably misaligned). So in 1983, I decided to build a very sharp AF filter for my printer (-3 dB bandwidth is 150 Hz, -60 dB is 680 Hz!). The filter output impedance is that of land-line POTS: 600 ohm. This matches the audio input impedance of Feld-Hell machines, as they were intended for use over telephone land-lines. The filter design is from Klaas, PA0KLS (ref. 3A, 3B). It uses five standard 88 mH toroids, surplus from telephone companies; 88 mH loading coils (in various forms, sizes, materials) have been used extensively on long analog telephone lines worldwide since the early 1900s. The 88 mH telephone toroids have become rather hard to find. There is a very good alternative: the Toko 10RB series. I bought two sets of five at a very reasonable price at JAB Electronic Components in the UK, for use in a filter per ref. 2J. Note that that you can find inductors of the same value for considerably less money elsewhere. However, you will find that they do not work in these filter applications: their DC resistance is much too high - at least five times that of the Toko inductors! I also have the parts lying in my drawer for a very nice active AF filter, with very few parts. It uses a switched-capacitor filter IC - much better than OpAmps! See ref. 2K. 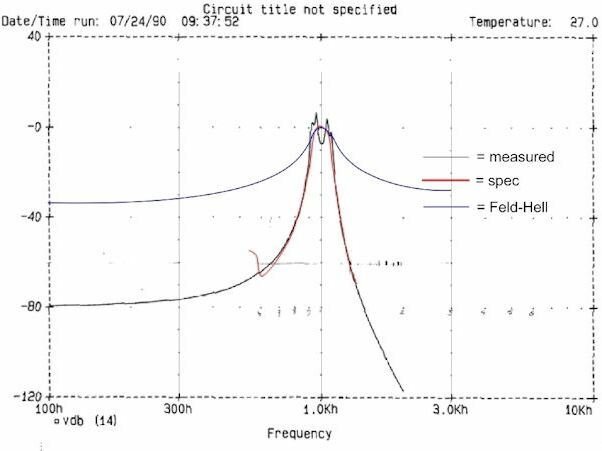 References 3C-3H discuss some other passive designs for narrow filters. Ref. 1H: "Zelfbouw HELLschrijver met nonstop Helix" & "Gereedschap voor HELL80 in startstop bedrijf", Arie van Oijen (PE1AQB), 2011, 10 pp. Ref. 1M: "High Speed 64x6x8 Static Character Generator", pp. 73-80 in in "Signetics MOS silicon gate 2500 series metal gate 2000/2400 series data book", Signetics Corp., 1972, 207 pp. Ref. 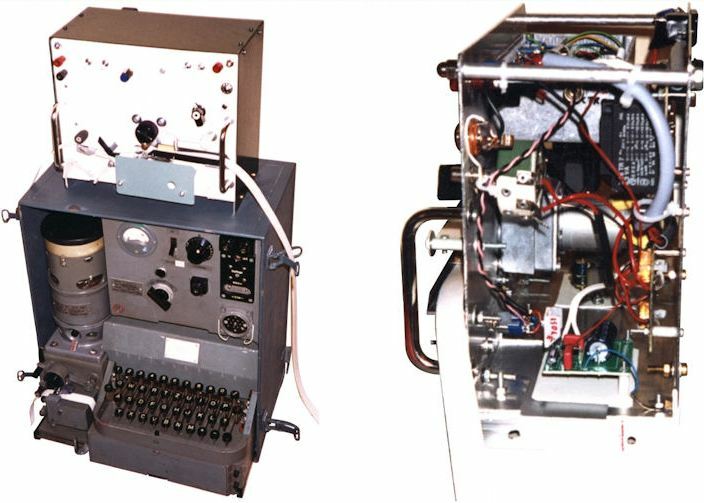 2A: "Radiomodem voor Hell, Morse en RTTY", Koos Fockens (PA0KDF), in "Electron", 10-12/1986 [in Dutch]. Ref. 2F: "Improved speed control", p. 18 in "NBTV Handbook", by Chris Lewis, Grant Dixon, Klaas Robers (PA0KLS), Version 2003.02.01, published by the Narrow-bandwidth Television Association. Ref. 3J: "Een passief laagfrequentfilter voor de ontvangst van telegrafie", Roelof Bakker (PA0RDT), in "Electron", January 1997, pp. 15-20 (incl. PA0KLS CW/Hell filter). Here is a small Excel spreadsheet that I made for calculating the filter component values.